Let customizable, modular, and easy-to-use smart-home automation help you take control of your own home—turn on lights automatically, let you know whether you remembered to lock the door, alert you if there's an intruder while you're away, and even help you keep an eye on your pet in the backyard. Of all the rooms in the house, my personal office is where I spend the most time. Thickly carpeted and paneled in wood, it’s a tranquil, comfortable space. Here’s the catch: Some of its pros are actually cons. Because it’s located toward the back of the house, on the second level, the office sits apart from the majority of household activity, at least during the day. That means I can work undisturbed for hours at a time, but it also means that I don’t hear the goings-on downstairs. Is there someone at door? Has my wife gotten home from work? I don’t know unless I get up and go downstairs to check. This frustrating lack of knowledge only intensifies when we go away for a few days, perhaps on a jaunt to our cabin. We’re left with plenty more, often quite worrying questions that I have no way to investigate. Is there a package waiting out on the front step, tempting a would-be thief? Or, wait a second, did I completely forget to lock the door? Has the place been ransacked for its valuables? We’re fortunate in that we’ve never had a problem. I’ve always been able to breathe a sigh of relief when we return home and find everything safe and untouched. Still, I’d like not to be so in the dark about the status and security of my greatest investment, my home. Of course, one answer would be to bite the bullet and install a full-fledged security system, but the cost turns me off. Plus, I want versatility, and traditional security options aren’t known for their flexibility. I don’t want to end up overspending on bells and whistles that I don’t really need. 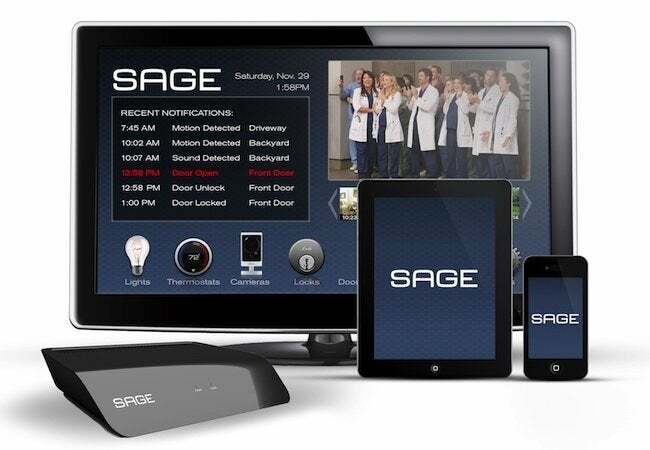 That’s why, when I learned about SAGE by Hughes and its brand-new, innovative line of home automation and security products, I got excited. Its modular design would enable me to devise a solution customized to my needs, involving only those components that I’d actually use day to day. 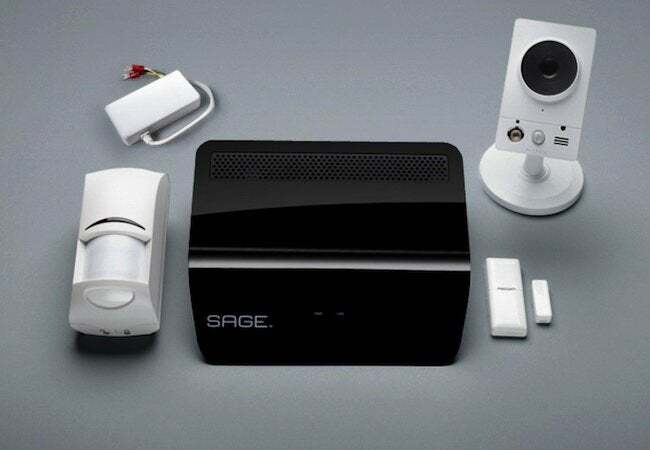 SAGE by Hughes offers a full suite of sensors and cameras, locks and switches—indeed, all you could possibly need to make your residence smart and secure. You can install your chosen components all at once or, as I plan to do, add onto the system gradually over time. To get started, I chose not a set of individual components, but the SAGE Security Kit, a bundled package of essentials that I judged would be perfect for what I planned to devise: a system that would both reduce the isolation of my office while I’m working and provide peace of mind when we’re away on family trips. First, I installed the Doorbell Sensor (with help from the step-by-step video instructions). The result? Now, it no longer matters if I don’t hear the doorbell, because an alert arrives on my phone, telling me there’s a visitor. Next, I installed the Door Sensor so that if someone enters the house, I know right away—again, thanks to a message sent to my phone. (Don’t worry—if you are expecting family members to be going in and out of the house all day, it’s easy to disengage the alerts.) Also in the kit: a Motion Sensor and an Indoor Camera. For now, I have both in the living room. No matter the specifics of your individual solution, every SAGE setup has one thing in common—the hub. 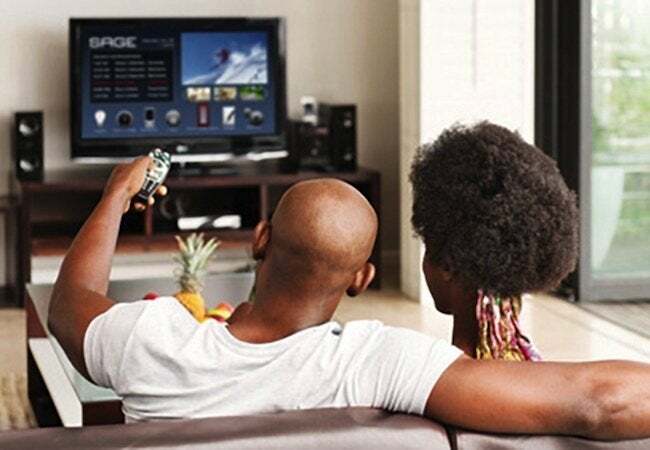 As the heart of the system, the hub connects to your TV, syncs all components, and becomes the command center. Here’s where you configure your SAGE and, by following intuitive prompts, define the rules that control its behavior. If, for instance, the Motion Sensor ever detects movement in the living room when I have set the system to vacation mode, the hub knows to activate the Indoor Camera and send me an instant notification. Although I sincerely hope an alert never comes, what if one did? What if, on a day when I was traveling, SAGE alerted me to an intruder? Unlike other smart-home security options, SAGE offers a unique feature, MyLocal911, as part of its entirely optional $9-per-month Premium Service. Here’s how it works: If I have reason to believe my home is in jeopardy, I would immediately call the police. But if I’m at the family cabin, dialing 911 would connect me to the force nearest the cabin, not the force nearest the break-in. MyLocal911 simplifies the situation, connecting directly to the appropriate police station. Clever. Already, after only a few weeks with SAGE, I’m thinking about adding more components. One possibility: Outfit the entry hall with the SAGE Light Switch and LED Bulb. That way, I can have lights turn on automatically whenever the front door opens after, say, 5 o’clock in the evening. Another idea: Install the Outdoor Camera so I can check to make sure the dog’s OK without having to go out into the yard. As the online purchasing process is as seamless as the system itself, it’s tempting to envision new ways to put the SAGE solution to work in my home. I’ve been stunned to discover how easy (and frankly, fun) it can be to gain control over the household inefficiencies and anxieties that used to drive me batty. Now, I really believe it when I read an article or see something on TV about home automation being the wave of the future. I think of it like this: In recent years, technology has been making our lives easier and more enjoyable in so many ways. And now, thanks to systems like SAGE, we can use technology to solve those problems, large and small, that we encounter all the time in our own homes. It’s a bright future, indeed! HURRY: Until April 30, 2016, you can enter to win SAGE by Hughes kits and components in the Easy Is Awesome sweepstakes—go now! This is a sponsored conversation written by me on behalf of SAGE by Hughes. The opinions and text are all mine.